Since last year, I stopped waiting spasmodically for my birthday. An additional year of life doesn’t mean anymore the acquisition of a new right (the last right that I gained was, at 25, the possibility to vote for the Italian Senate of the Republic), but just being a little closer to the natural conclusion of my life cycle. Apparently, for Zuckerberg my data aren’t good enough; now, he wants me to start raising funds for the public good too. 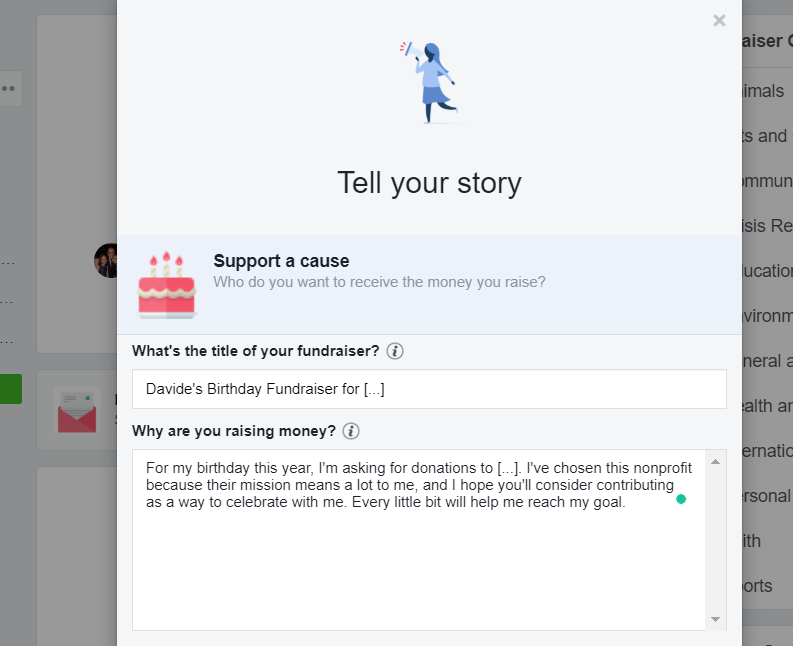 This new fundraising feature appeared in August 2017 and it allows Facebook users to start fundraisers for the causes that they care about. All you need to do is pick a nonprofit from a pool of +750,000 organizations (yes, three zeroes) and in a few, easy steps you can ask your friends to throw in a buck to make the world a better place. With a brilliant strategic move, Facebook gurus decided to focus on birthdays since birthday dates are already quite central to our daily lives in Zuckerland. Moreover, the new feature taps into an evident need for personal validation. The strategy paid off. Last August, the social network announced that in one year this new functionality raised over $300 million. At the beginning, the company took a fairly standard 5 percent fee on every donation. However, in November 2017, it abolished the fee and now 100 percent of donations made through the platform go directly to the selected nonprofits. In a time when the "overhead myth" dominates public opinion, the Menlo Park juggernaut guarantees that all your money will go straight to the charity you decided to help. Sounds good, eh? 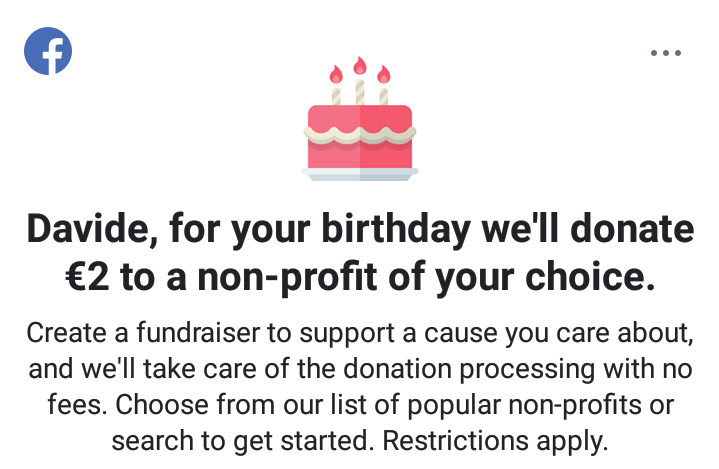 Moreover, if you’re not convinced by its first invitation to create a fundraiser, Facebook will come up with a new banner, also strategically positioned at the top of your newsfeed, that promises to donate €2 to a non-profit of your choice, if you just create a fundraiser for it. All you need to do is pick a cause that you think is worthy and make it public. Facebook will do the rest. Small donation included. This is probably the lowest-effort philanthropy one can think of. In the realm of Facebook, doing good is so easy that it takes more effort not to do it. Only Pennywise the Dancing Clown would dare to say that setting up a birthday fundraiser for, let's say, disabled kids is "bad for business". Then why am I then bothering to write a piece that supposedly exposes the “problem” of FB fundraisers? My main issue with this nifty feature is that it propagates an unsuccessful approach to philanthropy; I’ll explain my claim showing how the (extremely smooth and user-friendly) process of setting up a fundraiser on the platform works. You can scroll the list or search for an organization yourself. There’s also a sidebar menu that helps you navigate the charities by category. Apparently, the list is tailored mainly on your location, friends, and friends’ likes. Standard Facebook algorithm. Information about the organizations’ effectiveness or impact is nowhere to be found. 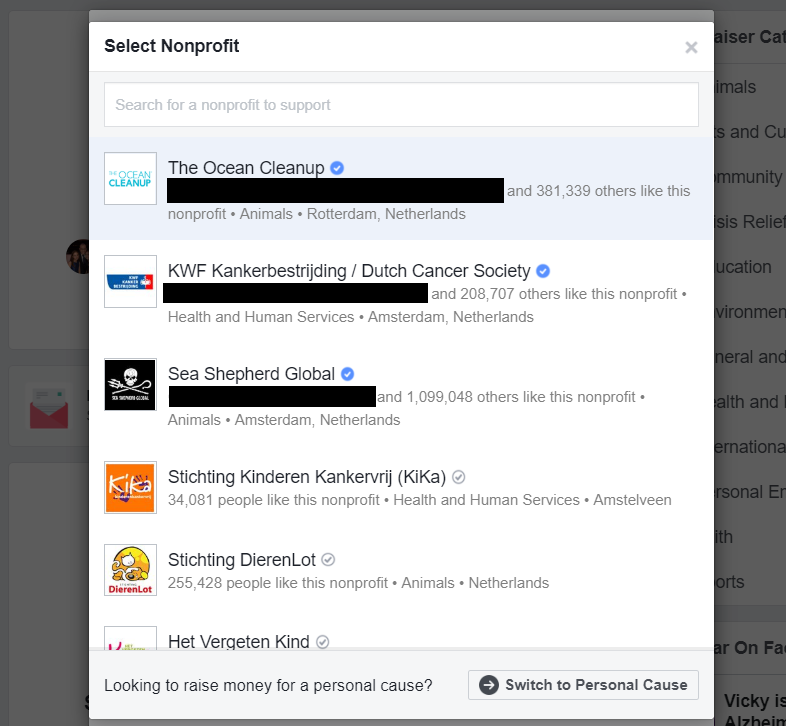 When it’s time to share your fundraiser, Facebook will pop this window, suggesting a possible text to “tell your story”. And that’s the main problem at the core of Facebook fundraisers; they’re just another declination of self-expression. “I’ve chosen this nonprofit because their mission means a lot to me,” Facebook suggests to write. In this conception, raising funds for a charity is just another way to tailor your virtual self and to express a sense of belonging, akin to sharing a political post or a romantic picture with your partner. It’s a replica of the same echo (ego) chamber mechanism that causes us to cluster in groups of private interests, losing sight of the possibility of a common, shared good. On social media, it’s all always about you and your damn story. But altruism shouldn’t be a prosecution of the ego by other means. Quite the opposite, it should be about, well, others. I’m aware that this problem doesn’t start with Facebook. Philanthropy has always been also about feeling good about ourselvesand promoting the causes that we’re for several reasons inclined to care about. However, social media certainly amplifies this logic. The problem is that this approach to fixing the world’s problems is doomed to fail. If we want to make the world a better place, we need to adopt a more rational, evidence-based approach to doing good. That’s the kind of “Copernican revolution” of philanthropy that a social movement and philosophy called “Effective Altruism” proposes: shifting the focus of our altruistic efforts from “what we care about” to “what we should care about”. For example, EA activists claim that, if we want to solve the world’s problems, we need, first off, to make some cause prioritization and select the issues that we ought to tackle first; according to EA, those are ending radical poverty, stopping intensive animal farming, and taking care of our “long-term future” which basically means the minimization of global catastrophic risks (like the singularity). At the same time, we should be careful to only donate to organizations that can maximize the positive impact of our money. These are dimensions that are completely lacking in Facebook birthday fundraisers. If only the social network started to pay more attention to these aspects, this neat functionality might lead to much greater good.